Chairs should take a seat in the front row of the room specially reserved for the next session's chair, at least 20 minutes prior to the session that he/she is scheduled to chair. As there will be no announcement or cue, please proceed to take the stage promptly at the appointed time and initiate the session. We request for your cooperation to ensure that your session proceeds according to the prescribed time limit/schedule. All presentation must be made in the form of PC presentation in English. Please be punctual and carefully follow the allotted time limits. When the presenter ahead of you takes the stage, please be seated in the Next Speaker seat. The resolution of the screen will be XGA (1920×1080). Use only the standard fonts provided with Microsoft PowerPoint for Windows. Virus scanning in advance is desirable. Prepare your presentation on USB memory or on CD-R. Do not use CD-RW. Save your slides as a Microsoft Windows7 or later for Windows file. Be sure that your file is compatible with Windows operation system, such as Microsoft PowerPoint 2007 / 2010 / 2013 / 2016. Remember to bring your own power adaptor and cables. Your computer must be equipped with a Dsub-15 pin video output. Please prepare your slides with Microsoft PowerPoint. PC prepared by the conference will handle Windows and Macintosh versions of Microsoft PowerPoint only. In case of that you cannot connect to the projector provided by the conference, please bring a backup CD-R or USB memory containing the presentation file in a Windows or Macintosh version of Microsoft PowerPoint. Presenters are responsible for determining in advance whether their notebook PC is capable of outputting video to an external display. This is especially important your presentation contains a large amount of data and audiovisual content. All energy-conserving functions such as screen-savers, sleep/power-saving modes should be disabled on PCs to be used in the presentation. Your password also should be inactivated. The version for Windows Media Player will be 12, and movie file must be included in the SAME FOLDER as the presentation file. Conference staff will be on hand at the PC Preview Desk to assist speakers. The speaker's podium is equipped with a PC. Speakers are asked to operate during the presentation by themselves. After the congress, all presentation data installed on the conference supplied PC will be deleted. To ensure full transparency, it is planned for any conflict of interest (COI) to be openly declared and identified at the beginning of every presentation to inform the audience. Please use the templates provided for declaration of the presence or absence of COI. 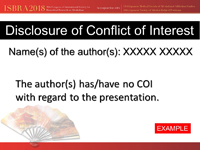 Please download the COI slide templates below for the disclosures. Poster Materials should be prepared in English. Poster presenters are expected to stand by your own poster board at the scheduled Discussion Time. All poster boards will be assigned with a number which corresponds to Poster Number. Authors are required to mount their posters on the designated board and remove them during the specified time. Please use push-pins to affix your poster presentation to the board firmly. The Secretariat will provide equipment and items required for affixing the posters. Any posters left after the scheduled removal time will be disposed of by the Secretariat. The poster board size is 900mm wide by 1900mm high. Please download the slide templates for the disclosure below.